Henry Curry. The business originally sold telephones built by Mr. Curry. Currys expanded into selling toys, bikes and electrical products and now there are now 295 Currys superstores and around 80 Currys high street stores. Curry’s gradually moved out of the high street and into out of town retail parks which afforded a lot more floor space to display a much greater range of products. Dixons officially merged the businesses and dropped the Dixons name. The Dixons Carphone group also own PC World, and there are a number of combined Curry’s PC World stores. Where can I check by Curry’s Gift Card balance? 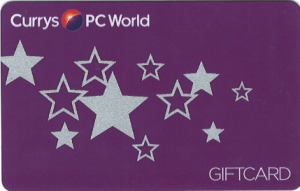 You can check your Curry’s gift card balance in any Currys and PC World store in the UK. Just take the card to the customer services desk (if they have one) or check at any till point in smaller Currys’s stores. You can click here to check your gift card balance. Curry’s work with a number of insurance companies to issue pre-paid cards to meet insurance theft or damage claims, including Direct Line. You will be able to check the balance of these cards using the link above if your card has a PIN number. If it doesn’t, you will need to check the balance in-store or refer to the letter from the insurance company that came with the card. Where can I spend my Curry’s Gift Card? You can spend your Curry’s Gift Card at any Currys or PC World store in the UK. You cannot currently spend your gift card at Carphone Warehouse stores. Does a Curry’s Gift card expire? Yes – if no transactions take place on the card for a period of 2 years (24 months) then the full balance will be lost. So use it – don’t lose it! Curry’s insurance replacement cards usually expire 12 months from issue.